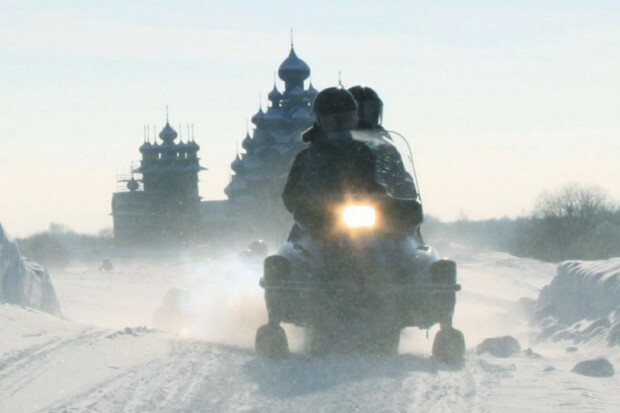 This snowmobile tour is a perfect getaway for those who have never tried snowmobiling as well as for those who want to experience true winter in Karelia first hand. Woods glistening under a thick blanket of snow, endless frozen lakes and traditional Karelian wooden architecture unite in full harmony with fun and excitement that you get from riding a snowmobile. 07:00/ 08:30 Meeting at the railway station with the guide. Transfer from Petrozavodsk to Kedrozero Settlement (90 km). Breakfast upon arrival. After breakfast, we take you through snowmobile safety instructions, do a riding briefing and equip you with boots, a special snowmobile suit and a helmet. Now it is time for your snowmobile adventure to begin! Today we will cover the distance of 80 km and plunge into the idyllic winter landscapes and the thrill of speed. Starting in Kedrozero we drive through ancient Karelian villages Pegrema, Yuzhny Dvor and Lypovitsy and across the second biggest lake in Europe, Lake Onego, to the world-known Kizhi Island. Tea with sandwiches on the way. Today’s highlight is the Kizhi Museum of Wooden Architecture and Cultural History with its gem and a UNESCO World Heritage Site, Kizhi Architectural Ensemble. Afterwards we drive to the tourist complex Ostrov and get accommodated. Hot sauna and substantial dinner will make a final touch for your perfect winter day. After breakfast we head back to Kedrozero passing by the same villages of Lypovitsy, Yuzhny Dvor and Pegrema. Total distance 90 km. Tea with sandwiches on the way. Transfer from settlement Kedrozero to Petrozavodsk (90 km). 18:00 Dinner at a café. 20:30 Departure for Moscow/ 22:40 — Departure for St Petersburg.